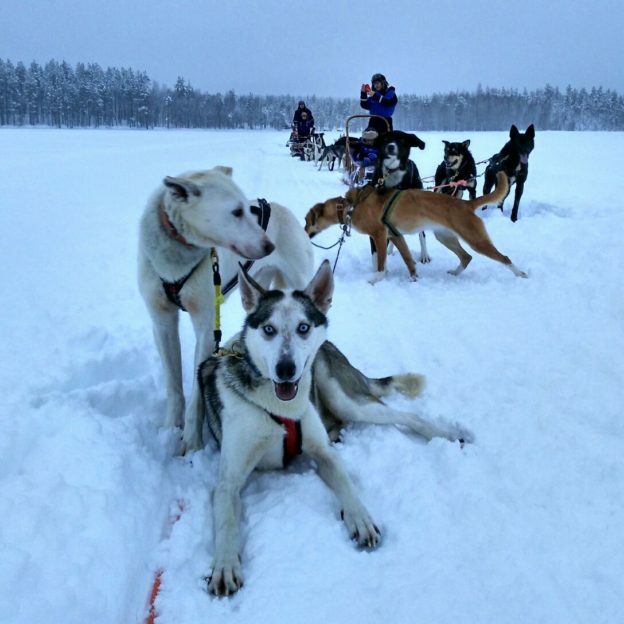 One of the most exciting winter activities in Finland would be husky safari. 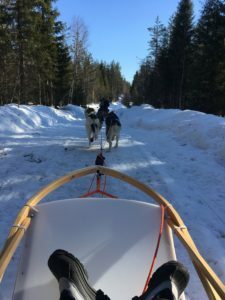 Actually I kind of underestimated this activity before I tried, but I would say you should try this if you come to Finland during winter and spring time! 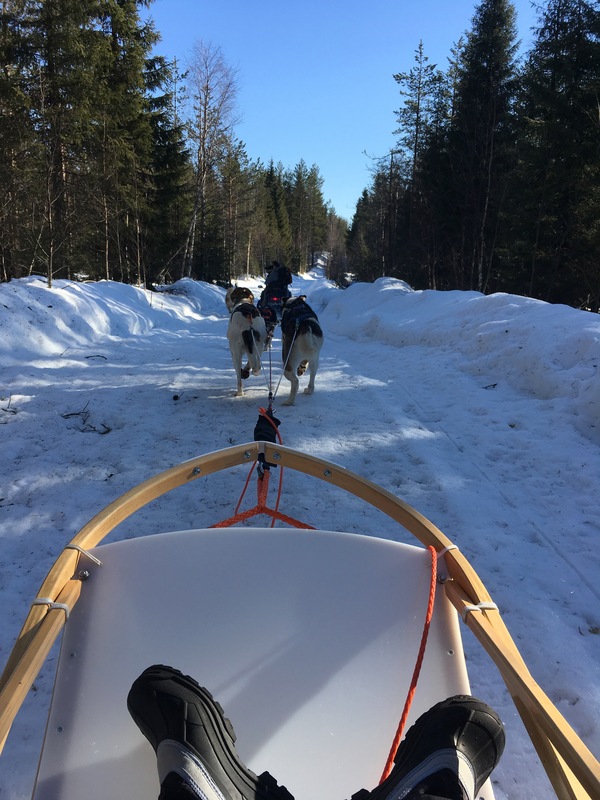 Some people might think that you just sit in the sleigh and get pulled by several huskies on the snow in this safari, but one of the key parts is that you are the one who drives or controls those running huskies! 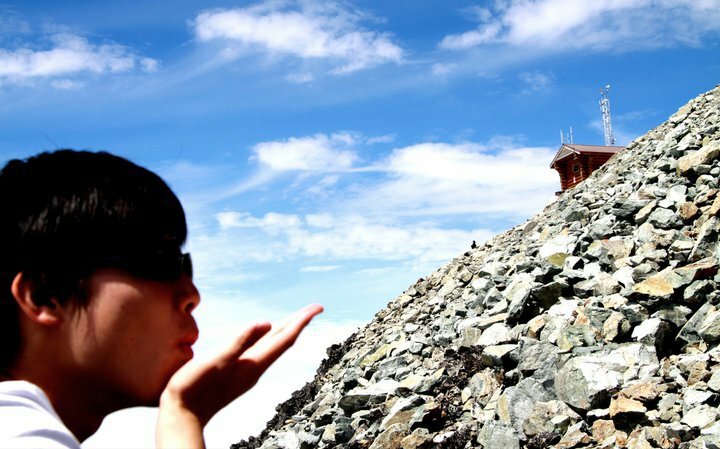 It can be done by usually two persons. One drives (controls) the husky sleighs and the other one sits in the sleigh. Usually, the driver changes on the half way and I would say 1 hour (30 mins driving for each) is enough since it’s pretty exciting and you would probably need to concentrate especially when driving the sleigh. 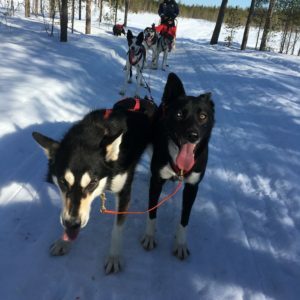 You can find various husky farms in the northern part of Finland and most of the local travel agencies offer husky safaris so you can find quite easily. I tried it at the suburb area of Rovaniemi. When you arrive in husky farms, you will first be welcomed by the main actors in this activity. Those huskies will probably start barking and licking you to show their excitement. Then you will get the brief instruction and learn how to control the sleigh. Even if you are not good at driving vehicles, no worries! You just have to lean your body to right or left to help them turn the corner as well as put a brake when your instructor tells you to do. Usually one person sits in the sleigh and another one who controls the sleigh stands on the back. Huskies run probably faster than you imagine in the forest trail or on the lake completely covered by snow, and it is actually pretty exciting!! Also, you always need to check hand sighs made by the instructor who drives a snowmobile ahead of you, because he/she tells you when to put a brake to slow down. I tried that in the beginning of April when the season of husky sleigh is almost ending. Therefore, the snow on the edges of the trail were a bit melting and soft and our sleigh got stuck in the deep snow twice when turning the steep corners. 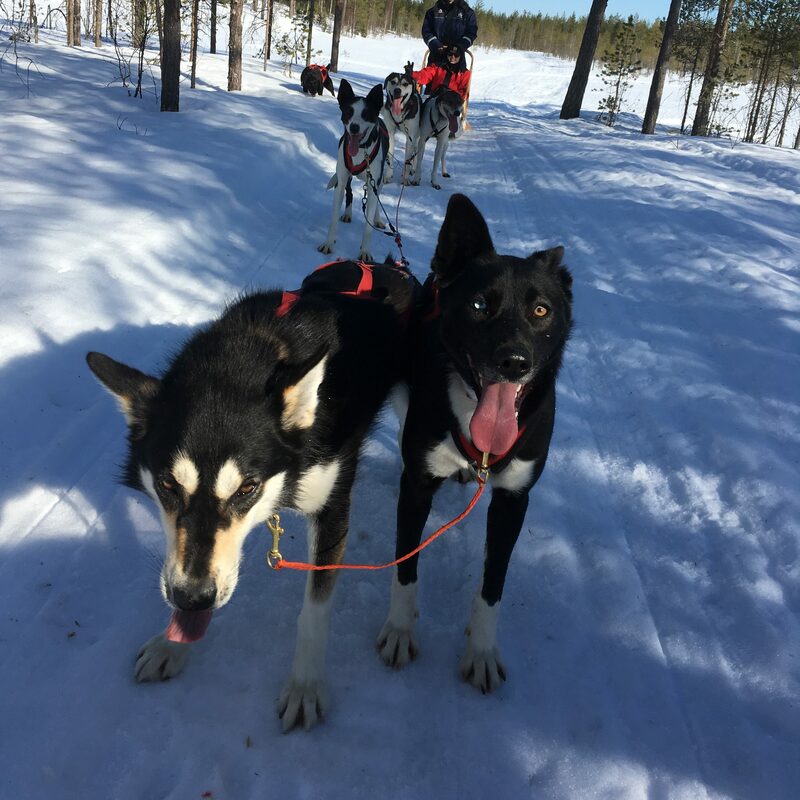 As huskies are so energetic and looked like they were excited to run around with the customers, they don’t usually care if the sleigh is coming along them. When our sleigh got stuck in the ditch, they still kept running until the instructor (guide) stoped them. After the safari, the instructor will make fire and provide you some snacks like sausages, hot drinks, and cookies. 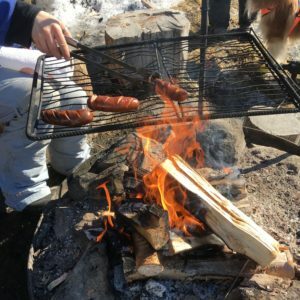 It is common in Finland that people make natural bonfire in the nature and grill food. 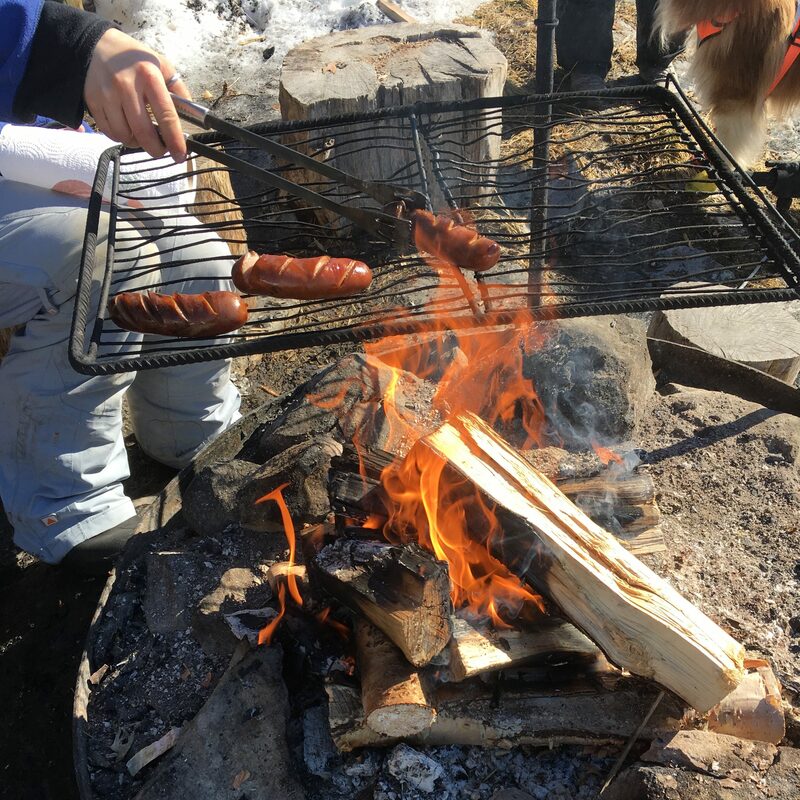 These are normal sausages but imagine if you get some warm treats with the beautiful Arctic view in a local way. 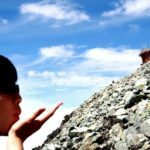 If you are interested in Finnish nature and animals, you can’t miss this! I highly recommend this activity.